Cliff House Cottages are situated in Ebberston village in the 4 acre grounds of Cliff House, a Grade II listed former manor house. There are 5 cottages within the grounds. Entrance porch with steps down to a fitted kitchen with dishwasher and lounge with open fire and flatscreen TV with freeview. Separate dining room and downstairs WC. First floor has large double bedroom with television, twin bedroom and bathroom with over bath shower and WC. Lilac has a built in stair gate. Full gas fired central heating. Private entrance to ground floor with a fully fitted kitchen with dining area. Double bedroom. First floor has a cosy lounge with views of the garden, small bathroom WC. Full gas central heating. Private entrance hall and staircase. Bathroom with over bath shower & WC. Spacious newly fitted kitchen-dining room. Separate lounge with freeview TV leading to double bedroom with exposed beams. Full gas central heating. Entrance to hall, bathroom with over bath shower and WC, twin bedroom. Steps down to dining area and fitted kitchen with dishwasher and archway leading through to lounge with open fire. First floor has 1 double and 1 single bedroom. Separate WC. Beech Cottage has full gas fired central heating. Entrance hall-cloakroom with adjoining W.C. A large lounge with open fire. Separate kitchen-dining room. The kitchen has a dishwasher.First floor comprises bathroom with WC, a double bedroom and two twin bedrooms. Holly has full gas fired central heating. 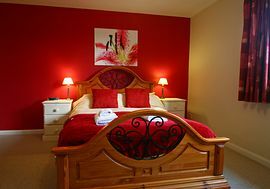 All the cottages have the use of our indoor heated swimming pool, jacuzzi, games room and our beautiful Victorian walled garden with its unique ancient, yew tree tree-house. All the cottages have their own parking space within the peaceful gravelled courtyard area. Ebberston village is a small, pretty village with one superb pub serving delicious food. 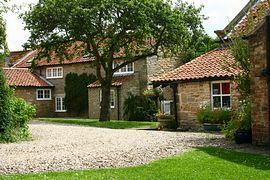 It is well placed to enjoy the beautiful countryside of the Yorkshire moors and coast being only 20 minutes from Scarborough, 30 minutes from York and Whitby and only 6 miles from the North Yorkshire Moors steam railway at Pickering which runs daily trips to Grosmont,Goathland. We are also only 20 minutes from Flamingo Land theme park and Eden Camp War Museum at Malton. Free hire of cots, highchairs and stair gates and we include all bed linen and towels free of charge. For those cottages with an open fire, we provide the first basket of logs free. A proper Yorkshire welcome - Yorkshire tea and a Yorkshire treat! Lilac Cottage: Maximum weekly price during Summer £642. Minimum weekly price in Winter £343. Apple and Pear Cottages: Maximum weekly price during Summer £476. Minimum weekly price in winter £262. Beech Cottage: Maximum weekly price during Summer £1001. Minimum weekly price in winter £426. Holly Cottage: Maximum weekly price during Summer £1,150. Minimum weekly price in winter £450. are priced at 70% of appropriate weekly rate. Lilac Holly and Beech: Saturday start. Apple and Pear: Friday start.